The Classic II was tested on 2000.10.08 under System 7.5.5 using both an external 160 MB hard drive and its internal 80 MB drive. The Mac Classic scores 1.0 in Speedometer 3. Disk tests for the internal drive were slightly lower at 1.92 (32 KB), 1.92 (64 KB), 1.90 (128 KB), and 1.70 (256 KB). With this particular setup, the smaller disk cache provides the best performance under Speedometer 3. As with other tested systems, disk performance under Speedometer 3 is worst with a 256 KB cache. The big question, of course, is how well it compares with the SE/30. In a nutshell, not too poorly considering how much less it cost and the limitations of the hardware design (see our Road Apple article for details.) CPU, graphics, and disk performance (using the same external drive) are 94% that of the SE/30, while math performance is at the 84% mark. The computer was tested on 8 October 2000 under System 7.5.5. Results are relative to a 25 MHz Quadra 605, which rates 1.0. Numbers are rounded off to two decimal places. The fifth test is with our benchmark drive, an external Quantum ST2.1S with System 7.5.5 installed and extensions off. This test demonstrates that the Quantum LP40S inside the Classic falls well short of the computer’s maximum SCSI potential. Disk tests for the internal drive were slightly lower at 0.75 (32 KB), 0.75 (64 KB), 0.75 (128 KB), and 0.67 (256 KB). As with Speedometer 3, performance suffers at the 256 KB mark. The cache setting should have little influence on non-disk tests, which these numbers bear out. The big question is how well it compares with the SE/30. In a nutshell, not too poorly considering how much less it cost and the limitations of the hardware design (see our Road Apple article for details.) CPU and graphics performance are just the least bit behind the SE/30, while math performance is at the 84% mark. Disk performance is probably close, although the Classic II and SE/30 were not benchmarked with the same hard drive. The Quantum LP40S is an older, slower SCSI hard drive that was common when the Classic II was on the market. We also tested our default external drive, a Quantum Fireball ST2.1S. Finally, to measure how fast the computer accesses memory, we also tested ramBunctious, a great little shareware RAM Disk program. Numbers are KB/sec. Tests with other Macs show the ST2.1S runs faster then 4 MBps, so the 1,165 KBps write and 1,367 KBps read ceilings seem to be a limit on the Classic II’s SCSI bus. In comparison to the SE/30, which the Classic II replaced, write is only 78% as fast and reads 74% as fast. These tests show why the Classic II was considered a poor replacement for the SE/30 as a network server. 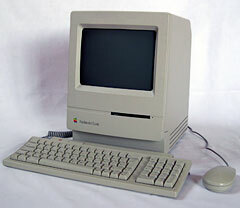 Where the SE/30 could saturate a 10 Mbps ethernet network with drives of that era, the Classic II could not. Finally, the ramBunctious benchmark shows that the memory bus on the Classic II averages about twice as fast as the SCSI bus. This is undoubtedly due to the 16-bit memory path.